Emergenetics® is a personality profile developed from decades of neuroscience research, and serves as the backbone of my comprehensive organizational development approach. Emergenetics® is a model for how the brain works, what makes our brains different, and how to use that knowledge to develop your organization from top to bottom. I’ll now explain the Emergenetics® model in greater detail. For years, what we understood about brains we learned through psychology. Behaviorists like Pavlov and Skinner developed models based on behavioral research. 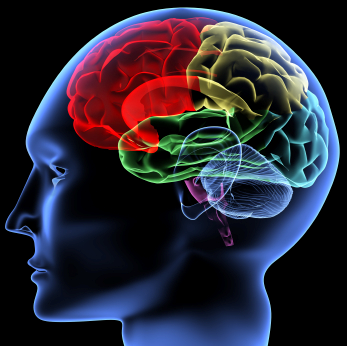 Psychoanalysts like Freud and Jung developed cognitive brain models. Things began to change once researchers understood the purposes of the two hemispheres of our brain. Roger Sperry (Nobel Prize in medicine, 1981) is the father of modern left brain-right brain theory. Sperry examined and built upon brain research conducted in the 40s and 50s and theorized that the brain actually functions as TWO brains – the left and right hemispheres have very different functions and, in fact, very different personalities. 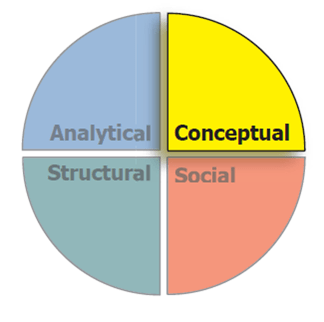 The following is a visual illustration of Sperry’s model. The two hemispheres communicate through a network of neural tissue called the corpus collosum. Information comes to the brain through the five senses and the two hemispheres constantly share the information and collaborate in its perception and processing. This is the complete Emergenetics model for the left and right brains. 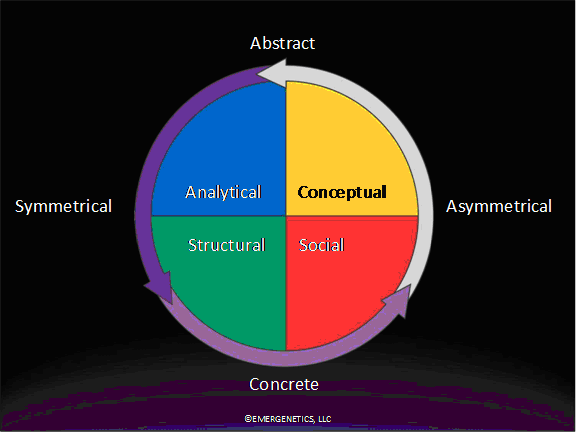 The two LEFT BRAIN thinking attributes are, in this model, called ANALYTICAL (abstract) and STRUCTURAL (concrete). 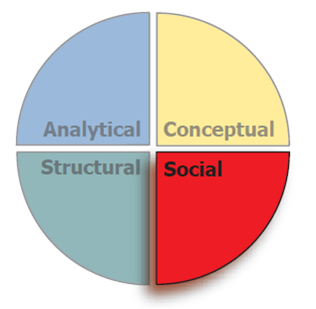 The two RIGHT BRAIN thinking attributes are called SOCIAL (concrete) and CONCEPTUAL (abstract). 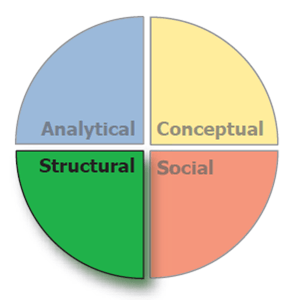 Now, let’s look at each of the four thinking attributes in greater detail. Analytical thinking is clear, logical and rational. 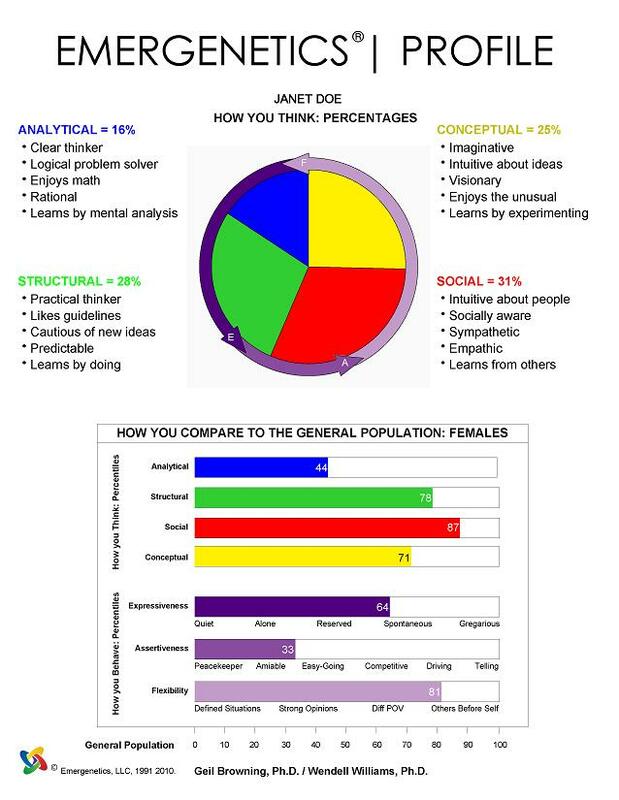 The analytical (Blue) brain enjoys math and science, tends to be objective and facts-driven, and is a logical problem solver. It enjoys all aspects of analysis – assessing strengths and weaknesses, weighing pros and cons, prioritizing, segmenting. It seeks to find the meaning behind the data. The Blue brain is critical and can be hard to approach. It only believes information it receives from trusted sources – new sources must prove their competence to earn its trust. The Blue brain challenges others and respects those who meet the challenge. Because of its reliance on facts and data, the Blue brain tends to overlook opportunities revealed by intuition. It may underplay the feelings of others (or disregard them altogether). To others, the Blue may appear intimidating, cold, distant, uncaring, hard to please and quick to judge. The Blue brain prefers to learn by mental analysis. Its teacher must be someone with impeccable credentials. It thinks and watches, tests theories and assesses ideas. The traditional classroom was designed with the Blue brain in mind. The Structural (Green) brain thinks practically. True to its name, it craves structure in life – plans, guidelines, processes, procedures, rules. The Green brain learns by doing, and enjoys performing activities. Process-oriented, it approaches learning systematically. It may enjoy outlining, organizing information, sequencing steps. The Green brain likes concrete concepts and hands-on experiences. Its problem solving approach is to proliferate ideas that seek to improve rather than replace or transform. It is energized by doing rather than contemplating, so it won’t dwell on the options for very long. This is a low-risk, high-yield approach that produces incremental, evolutionary change. Because of its reliance on proven solutions, the Green brain often misses the chance to try alternative solutions and novel ideas. Its tactical focus may lose sight of the big picture – it sees the trees but not the forest. The Social (Red) brain is intuitive about people. It’s socially aware and likes caring for others. It’s where our empathy lies. The Red brain favors a humanistic management approach with a leadership style that’s consultative. The Red brain prefers to facilitate discussion and interaction. In decision making, the Red brain tends to favor inclusive – the health of the group is paramount. It also trusts ‘the gut.’ Because of this, the Red brain may overlook the need to consider facts and logic. In communication, the Red brain prefers to hear, and tell, stories. It teaches and learns by metaphor. It also prefers to learn from others – interaction that involves plenty of doing, sensing and watching. If the Red brain is going to write about a subject, it wants to experience it first-hand and talk to others about it. In problem solving, the Red brain tends to frame problems as ‘people related.’ It discusses possible solutions with others to gauge how they’ll be affected. Its approach is emotional and intuitive. The Conceptual (Yellow) brain is the seat of our imagination. The Yellow brain is intuitive about ideas. Although all four thinking attributes can be creative, the Yellow is associated with blue-sky, innovative creativity – it seeks the novel, the new and different. The Yellow brain has a sense of adventure and enjoys the unusual. It’s strategic and visionary in its approach. Its management approach is experimental. It likes to try out new things and see how they work. The Yellow brain leads via initiation – it likes to get things started, focusing on a vision for the future and the strategy to achieve the vision. Because of its focus on the future and the big picture, the Yellow brain may lose sight of the details and trip over the things at its feet. It may eschew practicality and fail to see when doing things ‘the way we’ve always done it’ is the best solution. It may be insensitive to tradition. In communication, the Yellow brain asks leading questions that cascade to more leading question. It tends to frame things in an abstract manner, and freely uses metaphors. The Yellow brain learns by experimenting. It is energized by the trial and error process and enjoys self-discovery. The Yellow brain likes to take risks and multitask. In problem solving, the Yellow brain looks for hidden possibilities and proliferates imaginative ideas. Its approach is intuitive and global. 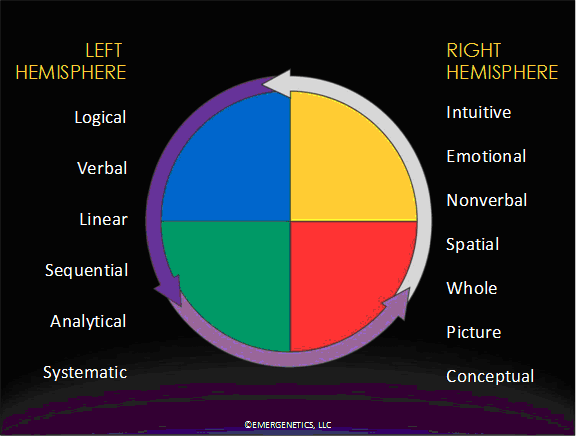 The Emergenetics® model deals not only with thinking styles, but with behaviors. Behaviors are what others see in you. People might not ever clearly see your thinking attributes, because they view them through the lens of your behaviors. Emergenetics® deals with three behaviors. There are of course many more behaviors that we acquire over our lives…but the three we’ll discuss shortly were selected to be the most relevant in a business environment. 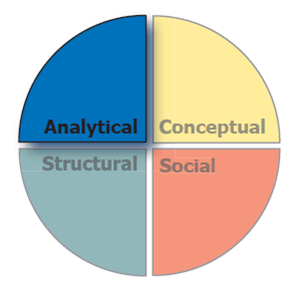 The three behaviors are measured across a percentile continuum of 0 to 100. The score can be thought of as a measure of the energy you put into each behavior. The three behaviors are Expressiveness, Assertiveness and Flexibility. Expressiveness describes the way you participate with others and the world around you. Expressiveness is similar to introversion and extraversion in Myers-Briggs. First-third expressives are seen as quiet and reserved, and prefer to listen rather than talk in group settings. Third-third expressives are more outgoing and animated, more likely to share information about themselves, and prefer to talk rather than listen in group settings. Often third-third expressives ‘think out loud’ and appear talky, while first-third expressives tend to ‘think before they speak,’ often for quite some time, and appear shy. Assertiveness describes the passion you put into expressing things like thoughts, ideas, beliefs, recommendations, and feelings. Consider a person who has just put forth a new idea to the team. She feels that her idea is the best, and should be adopted by the group. If she is a first-third assertive, she’ll passionate about achieving group consensus. She will be more willing to compromise in order to get the group to adopt her idea. First-third assertives often take on the role of facilitator and peacekeeper in an organization. If, on the other hand, she is a third-third assertive, she’s more driving and competitive, directing her passion at expressing her thoughts and convictions forcefully and directing action. She’s more likely to ‘stand on her own’ and defend her position, even if the group doesn’t agree with her. Lastly, Flexibility describes your willingness to accommodate the thoughts and actions of others. Let’s say that the team leader has made a decision and everyone has a task to perform. A team member who is first-third flexible generally believes that decisions are “cast in concrete” and don’t like to change direction unless there’s a good reason. If you give this person a last minute change, they will likely resist it. A team member who is third-third flexible considers decisions as “cast in mud,” and is more open to last minute changes. If you give this person a last minute change, they will likely accept it readily. Here’s an example of an actual Emergenetics profile. You’ll notice Janet’s profile contains two parts. The bottom section has bar charts depicting the test results for both behaviors and thinking attributes. The test results are in the form of percentiles. The top section has a pie chart depicting, not percentiles, but PERCENTAGES. It represents the way the Blue, Green, Red and Yellow thinking attributes are apportioned in your brain. A thinking “preference” is defined as a thinking PERCENTAGE equal to or greater than 23 percent. Since three of her attributes are greater than 23 percent, Janet’s preference is Green Red Yellow. Another shorthand annotation which takes into account both thinking and behaviors is *TSC-213.